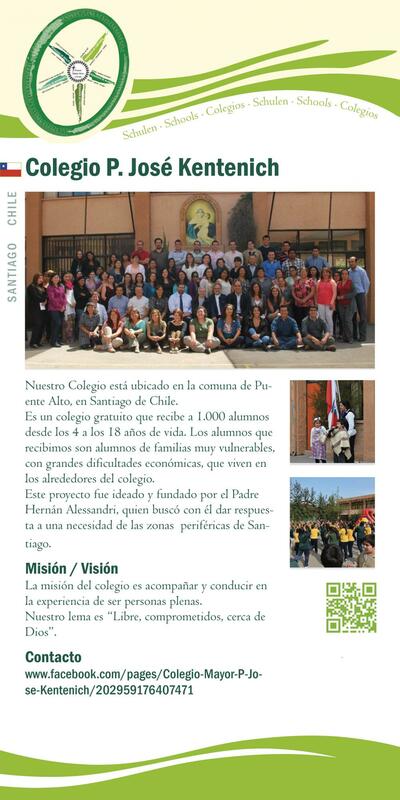 Our school is situated in the suburb Puente Alto of Santiago, Chile. It is a free school with 1000 students from the age of 4-18. Our students come from deprives area. The initiative and idea behind our school was given by Fr Her- nan Alessandri, a Chilean Schoenstatt Father. He wanted to offer an answer to the huge problems of this part of Santiago through a suitable educational program, not just for the chil- dren and youth, but also for the entire family. This education is based on the pedagogical principles of Fr Kentenich. That is also the reason for the day care centre for children, sports facilities and an office for promoting the family. The goal of our school is to accompany and lead the students on their way through life to become firm, and religious perso- nalities, according to the motto of the school, “Free, respon- sible and attached to God”.